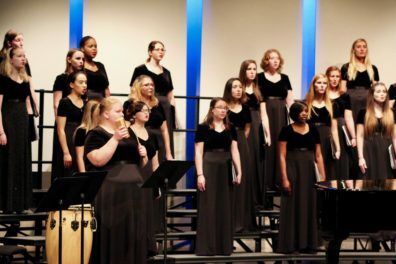 The WSU Treble Choir is an ensemble comprised of students who sing either alto or soprano. Our membership comes from across campus and most singers are non-music majors. We meet twice a week (3:10 – 4:00 PM Tuesdays and Thursdays) and perform at least three times a semester. Our repertoire is varied. We sing canon’s of choral soprano/alto literature (Britten’s Ceremony of Carols and Pergolesi’s Stabat Mater), but we also sing contemporary choral and pop/alternative music (Cups from Pitch Perfect and Pink Zebra’s We Won’t Stop Dreaming). We’re a very welcoming community and enjoy learning our music in a fun and nurturing environment. Although we hold our standards high we’re excited about helping our singers along their journey. If you have questions regarding our ensemble please don’t hesitate to contact me. In the meantime, take a listen to our ensemble (tracks below). We hope to see you in a future semester of WSU’s Treble Choir!